I still have my beloved doll from my childhood and fondly remember many hours spent with “Penny” when I was a little girl. Thirty years later, I love to watch my five year old daughter, Hannah playing with her baby dolls and it is so adorable to see her nurturing her babies the same way that I once did. For over 30 years, JC Toys has offered a wonderful selection of high quality, affordable baby dolls including collections such as La Newborn, Lil’ Cutesies, Lil’ Hugs and Lots to Cuddle Babies. Dolls are an excellent way to allow girls (and boys) to use their imaginations and role play. 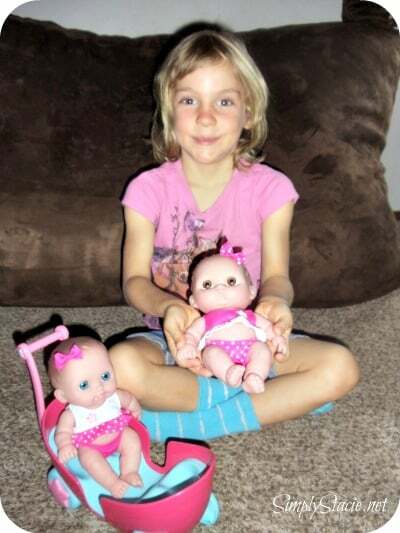 Hannah was thrilled to receive her twin babies from the newest collection of the Lil’ Cutesies dolls. The Lil’ Cutesies Twins in Stroller 8.5” ($29.99) is such an adorable set of dolls which come in their own stroller. Hannah loves taking care of her new babies and even made me laugh by commenting in an exasperated tone, “Wow, taking care of two babies is hard work!” She feeds and baths them, gives them lots of love and enjoys pushing them around in their stroller which makes a fun (but not annoying) bell sound. I love the attention to details in each Lil’ Cutesies doll because they have sweet facial expressions and adorable plump little bodies which is sure to make you want to cuddle them. JC Toys also has the most amazingly realistic dolls. For example, the La Newborn collection is very life-like and would be a great gift idea for a young child who is soon expecting a new brother/sister. They can “practice” having a new addition to the family with a doll that has realistic features and adorable facial expressions. If you are looking for the perfect doll for a special child then you are sure to want to browse the wonderful selection of dolls and doll accessories available at JC Toys! You are invited to visit JC Toys to pick out the perfect doll now. There are many different styles and prices to fit virtually (from $12.95-$59.99) every budget! i love the little cutesies bug theme, my niece is nicknamed buggie and she would love it! I love the Silly monkey!!! I like the lil cutsie set of 3. I learned that they have an online photo album you can upload your doll pictures to, that’s a cute idea. They’ve won over 15 awards! I love the Reaching For Love Doll. Thank you so much for the opportunity to win one. I like the Lil’ Cutesies 8.5″ with Buggy! I learned that the company is located in Miami, Florida.